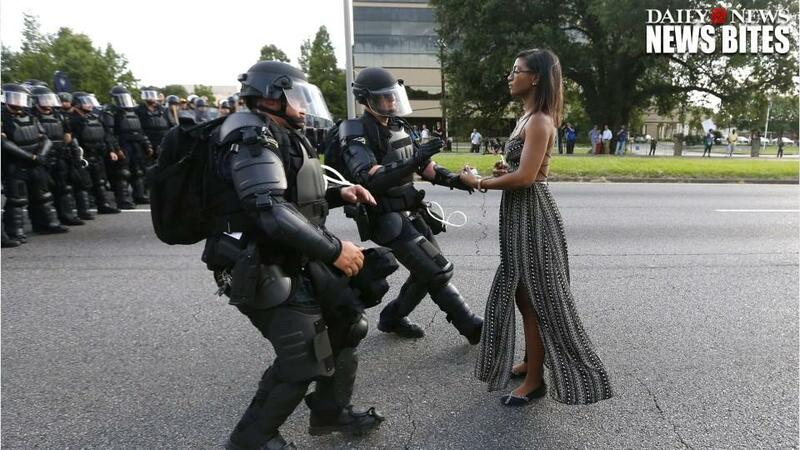 Protestor Ieshia Evans is detained by law enforcement near the headquarters of the Baton Rouge Police Department in Baton Rouge, Louisiana, U.S. July 9, 2016. REUTERS/Jonathan Bachman SEARCH "#BLACK LIVES MATTER" FOR THIS STORY. SEARCH "THE WIDER IMAGE" FOR ALL STORIES. July 11 (Reuters) - Photographer Jonathan Bachman was in Baton Rouge on Saturday covering the first protest of his career when he captured what has become for many the defining image of the Black Lives Matter rallies that have swept America this past week. "She had no facial expression at all. She just stood there," said Bachman, 31, who was on assignment for Reuters in the Louisiana state capital to cover the protests over last week's fatal police shooting of Alton Sterling, 37, in the city. "I knew it was a good frame and it was something that would tell a story," Bachman said about the moment his lens captured the image of Ieshia Evans, a nurse from Pennsylvania, before she was arrested. A Sheriff's Office jail log showed a 35-year-old woman with that name was booked on a charge of simple obstruction of a highway and had been released from custody. "When I came back to my car and I looked at that picture, I knew it would speak volumes about what was going on in that moment right there and over the past few days in Baton Rouge." The Atlantic magazine called the image "a single photo from Baton Rouge that's hard to forget," while the BBC hailed it as "legendary." The Washington Post said it "captured a critical moment for the country," while Britain's Daily Mail website called it "an iconic arrest photo." He said he turned around when he heard someone yell out to the woman: "You're going to get arrested!" "I got into position and it just unfolded right there in front of me," Bachman said. When he awoke the next day, he had received more than 100 texts and voice mails about the photograph, including one from his girlfriend saying: "I had no idea I was dating a celebrity." "I was just doing my job," Bachman said. "I felt like this was going to be an important photo, so I just took it."